The Scandic Marski offers occupants comfortable accommodations in Helsinki’s city center. The opera house, Finnish Museum, Kiasma Museum of Modern Art, and the National Museum are located within walking distance of the property, and many shopping outlets can be found in the surrounding area. Helsinki Vantaa Airport is just 11 miles from the Scandic Marski Helsinki. The hotel is comprised of 289 air conditioned guestrooms. All of the Hotel Scandic Marski’s rooms feature work desks, wireless Internet access, alarm clocks, safes, hairdryers, and mini-bars. 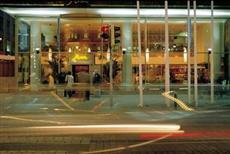 This property is a modern glass-fronted hotel that offers a wide range of modern amenities. Health conscious guests can enjoy complimentary access to the on-site gymnasium, and after a good workout can relax their tired muscles in one of the three traditional Finnish saunas. Guests looking to grab a bite to eat or that simply want to pass some time people-watching can head to the on-site Mediterranean restaurant and bar, which are located on the street-level. Visitors traveling on work-related matters can host meetings in one of the Scandic Marski Hotel Helsinki’s 4 meeting rooms, which feature versatile audio-visual equipment and ISDN connections.